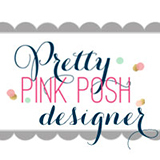 Welcome to the first day of the Pretty Pink Posh September 2017 Product Release Blog Hop! If you arrived here from the Shannon McComb’s blog you are on the right track. For my first card, I used brand new Autumn Blooms stamp set along with the Thoughtful Greetings sentiment stamp set. The Autumn Blooms set contains small flower & leaf images but we can create a bigger flowers with this set! I started by stamping small flowers (from the Autumn Blooms set) onto the watercolour panel randomly using VersaFine Onyx Black pigment ink. I then freely painted a circle around the middle of each flower using Festive Berries, Mustard Seed, Scattered Straw Distress inks and a wet paint brush. Once the watercoloured panel was dry, I stamped leaves (from the Autumn Blooms set) between the flowers, and then coloured them with Mowed Lawn Distress ink and water brush. I added some red & yellow ink splatters as well. It’s not difficult is it? For the sentiment, I used the Thoughtful Greetings stamp set. I heat embossed the “thank you” sentiment on black card stock in white, trimmed it down, and then put it up on the watercoloured floral panel using foam tape. For my second card, I used the Stitched Foliage dies and the Angel Friends stamp & die set along with the Giving Thanks stamp set. I die cut the stitched leaves from watercolour paper using the Stitched Foliage dies, adhered them on an A2 sized watercolour paper panel using glue pen. I then ink blended on it with Spiced Marmalade, Crushed Olive, Wild Honey, Victorian Velvet Distress inks and mini ink blending tool. I roughly brushed the inked leaves with a wet paint brush – Distress inks react with water. Once the panel was dry, I mounted it on white card base using double-sided tape first, and then added white ink splatters and a few 3mm clear sequins. For those adorable angels, I stamped them (from the Angel Friends set) on white card stock using Memento Tuxedo Black dye ink, coloured them with Copic markers, and then die cut them with the matching dies. For the sentiment, I used the Giving Thanks stamp set. For my last card, I used the Angel Friends stamp & die set along with the Winter Wonderland set. Yay! I love Christmas card!! I heat embossed snowflakes (from the Winter Wonderland set) on watercolour panel in white, and then made a snowy night scene using Peerless watercolors and a wet paint brush. Of course, I added white ink splatters and clear sequins! I watercoloured all adorable images – angels, eskimo girl, polar bear, igloo – with Peerless watercolors. There are 4 $25 gift certificates up for grabs (two winners each day). Winners will be picked randomly along the blog hop. Comments must be left by 11:59 PM PST on 9/19/2017. Winners will be announced on the PPP blog. All 3 cards are beautiful! You are so talented! Love how you mixed some older sets in there too! All three of your cards are fabulous! I love how you used watercolor to create your flowers on the first card! It was so clever to use your angels with the new leaves. Angels aren’t just for Christmas and this card is beautiful! Your Angel Friends card combine with Winter Friends is absolutely amazing! Everything about this card is gorgeous, from the snowy sky to the angels with the banner to the cute little Eskimo with his polar bear friend! Wonderful job on all three cards! Stunning cards! Your colouring is out of this world!!! Great cards – I especially love the leaves and angels! Your three cards are some of my favourite on this hop. Your use of colour is perfect. Thank you for sharing your creativity. WoW! Your triple-card samples are stupendous is coloring and in layout. I’m a fan of all three! Your watercoloring is so amazing on all your cards and very creative. I love the earth colors you used for the background of your Christmas card. True amazement! Thanks for sharing! I love all these cards. So creative. Your watercoloring is wonderful. Love your beautiful cards! You really have a way with the watercolors. Fantastic cards – love how you used this new PPP release! Thanks for sharing. Oh my! You are the last person on the Blog Hop for me and wow! Did you end it with some winners! The floral is beautiful and it is on only floral I saw. The colors are wonderful. The angels with the autumn leaves is exquisite and cute at the same time. We all need angels in our lives. And the grand finale — the precious igloo with the spaceman. Your coloring is wonderful on all as is your design. Thank you so much for sharing your talent! I love your projects so much! The beautiful bright colors you use on all your projects are so fantastic! Thanks so much for sharing! Stunning cards. You have a talent. Thank you for sharing and getting me inspired. Beautiful cards! Love the backgrounds on these! WOW! I don’t know which card I like better, amazing! All that water coloring is so beautiful! What beautiful cards you have made!! I love how you feature the newest from PPP as well as using some images and sentiments from past releases. (I will always think the ‘Giving thanks’ sentiment is gorgeous. The font is so eye-catching and appealing!) Great job, as usual, Yoonsun! Wonderful cards. Can’t wait to get my hands on these new stamps and dies. A wonderful release, and the cards you made are gorgeous! Your watercoloring is so pretty. such fabulous cards! I love how you use the angels with the water colored stitched leaves…great idea for a gratitude card. Love your Christmas cards. The coloring on the leaves is just great, too. Your cards are so cute. Really love the last card. Thanks for sharing them. Wow those added snowflakes really made it pop! !